The Isle Of Palms Resort is ideally positioned on a Island, tucked away in the tranquil cove of Pine Lake on the beautiful Gold Coast, offering guests a variety of Self Contained Townhouses within a secure complex and at an affordable price! You can choose from one of our 2 & 3 Bedroom Townhouses offering either Garden or Waterfront views. Alternatively checkout one of our larger 4 Bedroom Waterfront Townhouses or why not spoil yourself and try our 4 Bedroom Penthouse, which includes your own pool and private waterfront patio and garden setting. Our split-level, fully self contained townhouses include a fully equipped kitchen and laundry facilities, open plan living/dining areas and private bedrooms to provide you with a comfortable Home away from Home where you can relax and forget about the hassles of everyday life. With the multi bedroom townhouses catering from 1 to 9 people, the Isle of Palms is the perfect place for families, weddings, school groups, sporting teams or groups of friends wanting to be able to stay together under the one roof. The resort is a one-stop shop of recreation facilities offering something for everyone. Take a dip in either of the 2 swimming pools, let the kids splash around in the childrens wading pool, unwind in the spa, get active out on the 2 tennis courts, cook up a storm in the BBQ areas or sit back and throw a line out into Pine Lake that surrounds the resort. With the Pines Shopping Centre just across the road, you will enjoy the convenience of having everything you need at your fingertips. In fact you can do your shopping at Coles, Woolworths, Kmart or 50 of the specialty stores, wheel your purchases back to your unit and leave the trolley in the bays provided which will be picked up for you, by the shopping centre. Need a night out, why not call the Currumbin RSL courtesy bus to come and pick you up from the Isle Of Palms. 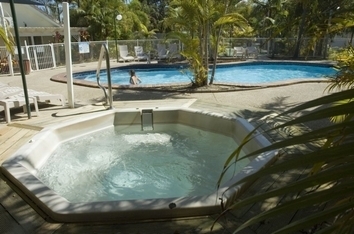 Once its time to get exploring, take all the work out of organising your holiday and see our friendly reception staff on the tour desk to purchase all your tickets then enjoy the Isle Of Palms perfect positioning close to the Gold Coast Highway and Pacific Motorway where you can easily access all of the Gold Coasts major sights and attractions. Beautiful Palm Beach and Currumbin Beach are just a quick 3 minute drive and the popular Theme Parks are just 25-30minutes by car. We look forward to welcoming you soon to the Isle of Palms Resort. Check in from 2.00pm. ). Persons making bookings must be over 18 years of age. Late Arrivals after reception hours, will need to use the after hours phone, located on the right hand wall at entrance to Reception. A valid Photo ID and Credit card security (signed) imprint mandatory at time of checkin. If no credit card available at checkin a $500 security bond is required. ARRIVALS AFTER 5.00pm , use telephone at Reception to access keys. Extra guests are welcome provided advance notice is given. Where additional bedding is required over and above the Townhouse type booked a fee of $25 per night is charged for rollaway. Travel south on the gateway Arterial/Pacific Highway - Follow Gold Coast signs - Continue through Nerang - Exit at Thrower Drive/Guiness Creek Road EXIT 93 - Turn right at the traffic lights into Guiness Creek Road - Continue through 1st set of traffic lights at the Pines Shopping centre - Turn right at next set of traffic lights - Coolgardie Street - Turn left into ISLE OF PALMS RESORT. Travel north past Gold Coast Airport - Keep in left lane and take Pacific Highway (M1) - Continue along M1 - Take Exit 93 (K.P. McGrath Drive with shopping centre on right) - Turn right at the Intersection into Guiness Creek Road - From Guiness Creek Road, turn right at 1st set of traffic lights into Coolgardie Street - Turn left into ISLE OF PALMS RESORT. The Gold Coast is a Mecca for visitor attractions, nightlife, dining out, not to mention some of the most beautiful beaches in the world. Whether is it the Theme Park attractions, wild life parks, day coach tours, theatre tickets and shows, fishing and boating trips, whale watching, taking a ride on a Harley Davidson, or simply finding the best surf beaches or bus route the staff at the Isle of Palms are here to assist you. Activities on site or locally would include Swimming, Tennis, Volley Ball, Games Room, and Fishing (Bring your fishing rods).